Boxing means you're most likely going to get punched in the face. In most cases, it means getting punched in the face a lot. This unavoidably means swelling on your face. Although this is often an inconvenient side of the sport that's not serious, it can also be a sign of serious injury. How you deal with the swelling after your bout can have a strong effect on how serious the injury gets. In boxing, you spend multiple rounds in a contest where somebody who knows how to punch keeps punching you in the face. When that punch makes contact, it causes trauma to the facial tissue. Blood and other fluids rush to that area, causing it to swell. After your match, and between rounds, your best treatment to reduce the swelling is to apply ice to the affected area. Cold makes your blood vessels constrict, reducing the blood flow to that area. Less blood flow means less swelling. The ice can also numb the area, reducing the pain from the impact. Continue icing the swollen area for 15 to 20 minutes at a time for several hours the night after your match, and for two to three days after the fight if swelling continues. You can also take anti-inflammatory drugs such as ibuprofen to help reduce the swelling and mitigate the pain. 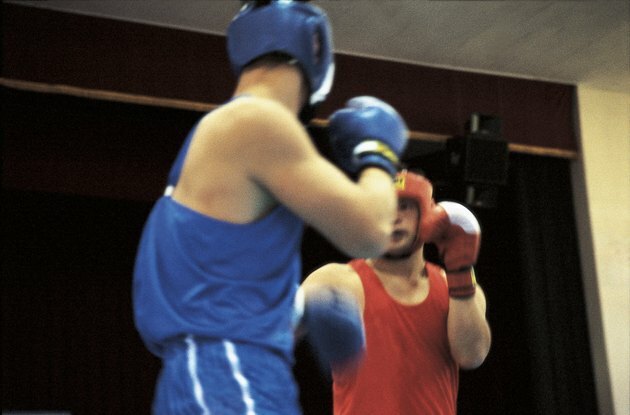 A swollen cheek from a punch to the face is not only normal, it's expected and often unavoidable. If you ice it and control the pain, you should be fine in a few days. If the swelling is accompanied by blurry vision, severe headaches or any feelings of tingling or numbness, check with your doctor or other medical professional. If the swelling persists for more than a week, check with your doctor. When in doubt, check with your doctor about any injury to the head, face or neck.